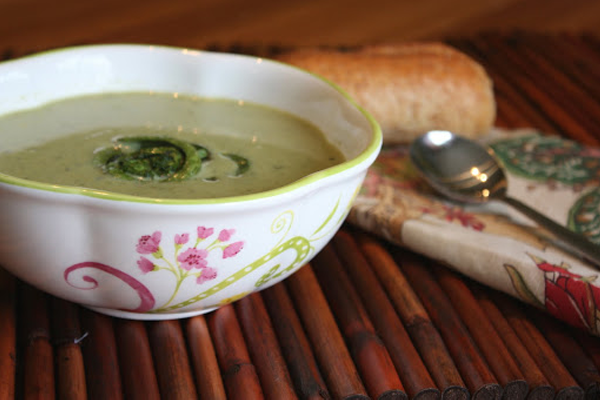 This simple soup is perfect for Fiddlehead Season – late spring. Add a nice side of crusty calabrese bread and fresh greens and you’ve got a great meal! In large saucepan, melt butter over low heat. Cook leeks, covered and stirring often, for 10-15 minutes or until softened, but not browned. Add flour and cook, stirring, for 2 minutes. Gradually stir in stock; increase heat to medium-high and bring to boil, stirring constantly. Add fiddleheads and return to boil; reduce heat to medium, cover and simmer for 5 to 6 minutes or until fiddleheads are tender. Remove 6 fiddleheads for garnish. Return puree to saucepan;whisking cream. Cook, stirring often, for 5 minutes or just until heated through but not boiling. Stir in lemon joice, white pepper, and cayenne; season with salt to taste. Garnish each serving with sour cream and a fiddlehead. * Health Canada recommends that fresh fiddleheads be washed in several changes of cold water. They should then be cooked in boiling water for 15 minutes or steamed for 10 to 12 minutes until tender. Water used for boiling or steaming fiddleheads should be discarded as it may contain the toxin. Fiddleheads should also be boiled or steamed prior to sautéing, frying or baking. In this recipe, as the fiddleheads were boiled in the soup, we chose to just rinse the fiddleheads a number of times in cold water before using them.